This year is the 75th anniversary of the foundation of the UPA [Eng. “Ukrainian Insurgent Army” – Ed. ], the military power, which fought against both the Nazi and the Stalinist totalitarian regimes to create an independent Ukrainian state. Due to valour of UPA soldiers, the occupation regime in western Ukraine started to stagger long before Ukraine was liberated from the Nazi invaders. 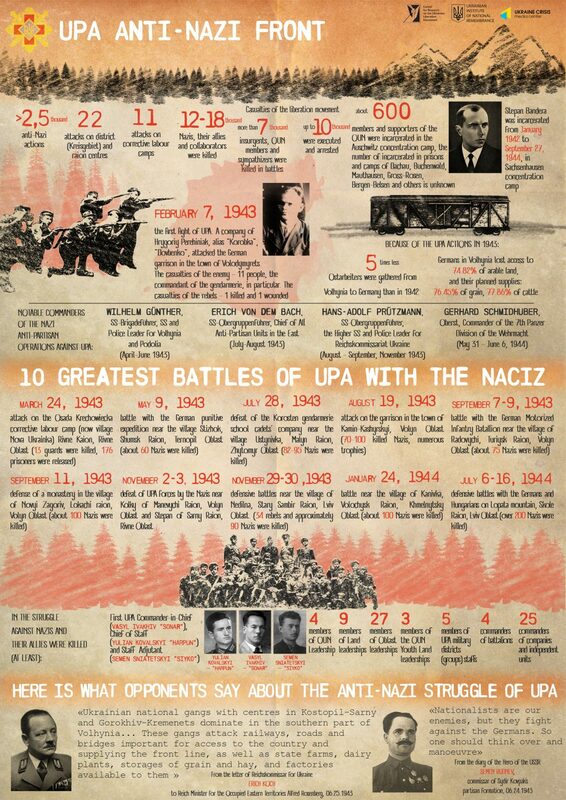 Ukraine Crisis Media Center together with Ukrainian Institute of National Remembrance and the Center for Research on the Ukrainian Liberation Movement developed this infographic describing the anti-Nazi struggle of Ukrainian insurgents and their contribution to the victory of the Allies.